202.Arumugam Manikandan, Vediyappan Veeramani, Shen-Ming Chen, Rajesh Madhu, Ling Lee, Henry Medina, Chia-Wei Chen, Wei-Hsuan Hung, Zhiming M. Wang, Guozhen Shen and Yu-Lun Chueh “Low Temperature Chemical Synthesis of Three Dimensional Hierarchical Ni(OH)2-Coated Ni Microflowers for High Performance Enzyme-Free Glucose Sensor” Journal of Physics Chemical C, In press, 2016. 201. Yindong Qu, Henry Medina, Sheng-Wen Wang ,Yi-Chung Wang, Chia-Wei Chen, Teng-Yu Su, Arumugam Manikandan, Kuangye Wang, Yu-Chuan Shih, Je-Wei Chang, Hao-Chung Kuo, Chi-Yung Lee, Shih-Yuan Lu, Guozhen Shen, Zhiming M. Wang and Yu-Lun Chueh “Wafer Scale Phase-Engineered 1T- and 2H- MoSe2/Mo Core-Shell 3D-Hierarchical Nanostructures Toward Efficient Electrocatalytic Hydrogen Evolution Reaction” Advanced Materials, In press, 2016. 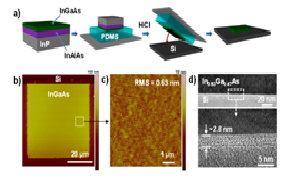 200.Doo-Seung Um, Youngsu Lee, Seongdong Lim, Jonghwa Park, Wen-Chun Yen, Yu-Lun Chueh, Hyung-jun Kim, and Hyunhyub Ko “InGaAs nanomembrane/Si van der Waals heterojunction photodiodes with broadband and high photoresponsivity, ACS Applied Materials & Interfaces, : 8 (39), pp 26105–26111, 2016. 199. Mani Sivakumar, Rajesh Madhu, Shen-Ming Chen Vediyappan Veeramani, Arumugam Manikandan, Wei Hsuan Hung, Nobuyoshi Miyamoto, and Yu-Lun Yu-Lun Chueh “Low Temperature Chemical Synthesis of CoWO4 Nanospheres for Sensitive Non-Enzymatic Glucose Sensor” Journal of Physics Chemical C, 120 (30), pp 17024–17028, 2016. 198. Yu-Chuan Shih, Tsang-Hsuan Wang, Jian-Shiou Huang, Chih-Chung Lai, Ying-Jhan Hong, and Yu-Lun Chueh “Roles of Oxygen and Nitrogen in Control of Nonlinear Resistive behaviors via Filamentary and Homogeneous Switching in Oxynitride Thin Film Memristor” RSC Advances, 6, 61221-61227, 2016. 197. Stuart R. Thomas, Chia-Wei Chen, Manisha Date, Yi-Chung Wang, Hung-Wei Tsai, Zhiming M. Wang, Yu-Lun Chueh “Recent developments in the synthesis of nanostructured chalcopyrite materials and their applications: A perspective” RSC Advances,6, 60643-60656, 2016. 196. Shu-Jui Chang, Ngoc Lam, Chao-Yao Yang, Yong-Lun Chen, Ying-Hao Chu, , Yu-Lun Chueh, Yuan-Chieh Tseng “Tunable Complex Magnetic States of the Epitaxial Core-shell Metal Oxide Nanocrystals Fabricated by Phase Decomposition Method” Journal of Physics D: Applied Physics, 49, 275001, 2016. 195. Chih-Chung Lai, Shih-Ming Lin, Yuan-Da Chu, Chun-Che Chang, and Ming-Chang Lu and Yu-Lun Chueh “Tunable Endothermic Plateau for Enhancing Thermal Energy Storage Obtained Using Binary Metal Alloy Particles”, Nano Energy, 25, 218-224, 2016. 193. Tsung-Ta Wu, Chia-Ho Chang, Cheng-Hung Hsu, Wen-Chi Tsai, Hsu-Sheng Tsai, Yu-Ting Yen, Chang-Hong Shen, Jia-Min Shieh, and Yu-Lun Chueh, “30×40 cm2 Flexible Cu(In,Ga)Se2 Solar Panel by Low Temperature Plasma Enhanced Selenization Process" Nano Energy, 24, pp 45–55, 2016. 191. 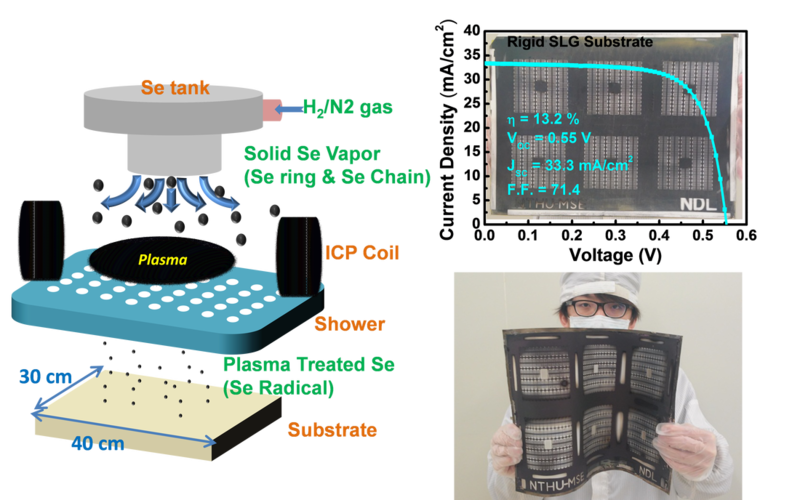 Hung-Wei Tsai, Stuart R. Thomas, Chia-Wei Chen, Yi-Chung Wang, Hsu-Sheng Tsai, Yu-Ting Yen, Cheng-Hung Hsu, Wen-Chi Tsai, Zhiming M. Wang and Yu-Lun Chueh, “Enhanced Conversion Efficiency of Cu(In,Ga)Se2 Solar Cells via Electrochemical Passivation Treatment” ACS Applied Materials & Interfaces, 8 (12), pp 7777–7782, 2016. 190. Hsu-Sheng Tsai, Sheng-Wen Wang, Ching-Hung Hsiao, Chia-Wei Chen, Hao Ouyang, Yu-Lun Chueh, Hao-Chung Kuo, and Jenq-Horng Liang, “Direct Synthesis and Practical Bandgap Estimation of Multilayer Arsenene Nanoribbons” Chem. Mater., 28 (2), pp 425–429, 2016. ​189. Kevin Chen, Rehan Kapadia, Audrey Harker, Sujay Desai, Jeong Seuk Kang, Steven Chuang, Mahmut Tosun, Carolin Sutter Fella, Michael Tsang, Yuping Zeng, Daisuke Kiriya, Jubin Hazra, Surabhi Rao Madhvapathy, Mark Hettick, Yu-Ze Chen, James Mastandrea, Matin Amani, Stefano Cabrini, Yu-Lun Chueh, Joel Ager, Daryl Chrzan, Ali Javey, “Direct growth of single crystalline III-V semiconductors on amorphous substrates” Nature Communication, 7, 10502, 2016. 188. Wen-Chi Tsai, Stuart R. Thomas, Cheng-Hung Hsu, Yu-Cheng Huang, Jiun-Yi Tseng, Tsung-Ta Wu, Chia-ho Chang, Zhiming M. Wang, Jia-Min Shieh, Chang-Hong Shen, and Yu-Lun Chueh, “Flexible High Performance Hybrid AZO/Ag-Nanowire/AZO Sandwich Structured Transparent Conductors for Flexible Cu(In,Ga)Se2 Solar Cell Applications” Journal of Materials Chemistry A, 4, 6980-6988, 2016. 187. Hung-Wei Tsai, Chia-Wei Chen, Stuart R. Thomas, Cheng-Hung Hsu, Wen-Chi Tsai, Yu-Ze Chen, Yi-Chung Wang, Zhiming M. Wang, Hwen-Fen Hong, and Yu-Lun Chueh, “Facile Growth of Cu2ZnSnS4 Thin-Film by One-Step Pulsed Hybrid Electrophoretic and Electroplating Deposition” Scientific Reports, 6, 19102, 2016. 186. Angada B. Sachid, Mahmut Tosun, Sujay B. Desai, Ching-yi Hsu, Der-Hsien Lien, Surabhi R. Madhvapathy, Yu-Ze Chen, Mark Hettick, Jeong Seuk Kang, Yuping Zeng, Jr-Hau He, Edward Yi Chang, Yu-Lun Chueh, Chenming Hu, Ali Javey, “Monolithic 3D CMOS using Layered Semiconductors＂Advanced Materials, 28, 2547–2554, 2016.